The air was crisp and cold as we crossed the border into Massachusetts, luckily the wind was almost non existent and the skies blue, keeping the temperature just on the right side of freezing. We were heading to Great Barrington, a spot I've wanted to visit since some of its classics appeared in one of the early Dosage movies. Since then it has been further developed, but access is an issue and as such you have to tread carefully. You'll find no topo online and like many spots around the world, that's really for the good of the area. I was heading there with two friends, luckily one of them Sam Gardner is a Great Barrington regular and gave us the tour. The rock is incredible quality, some of the best granite boulders I've seen, it reminded me of the highest quality Swiss gneiss. The lines don't disappoint either, often running through perfect slot holds and beautiful slopers. Sam Gardner catching the crux move. If you're going to pull back on rock for the first time in five years there is no better place to do it than Great Barrington. 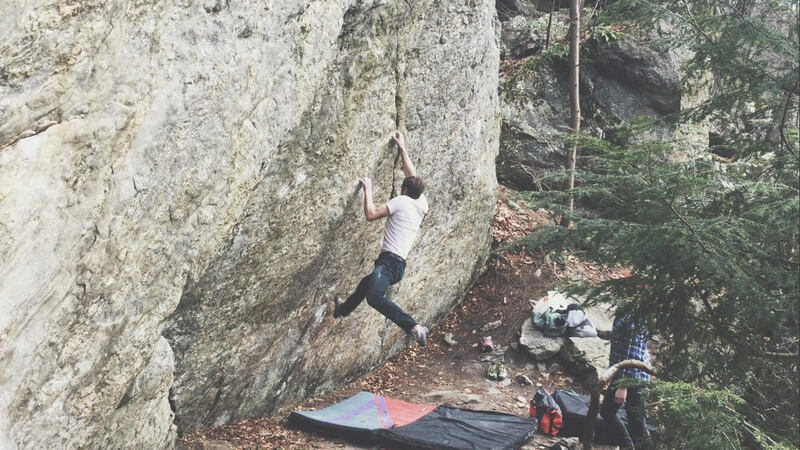 It felt incredible to chalk up and pull on, feeling the friction of perfect granite holds. I didn't care what I managed to send, for me it was the real start of the journey back to fitness - all that mattered was being back outside with good friends on fun problems. I guess it was lucky I had that mentality as not long after warming up on the classic Spack V4 and then giving The Bump a quick go, my ring finger on my right hand locked up and only the slightest pressure from any angle left me in immense pain. My climbing day was done. I can't deny I was gutted, but really I was more worried that I may have done lasting damage which could delay my route back to fitness. I'd felt strong on the rock and had moved well up to the crux move of The Bump on my first go. But maybe that was the problem - I'd been too eager to pull on rock. The last six weeks at the wall I'd focussed on slow and steady warm ups to avoid injury, but outside it's a different ball game. It's hard to warm up when the temperature is hovering around 32 degrees. To keep my psyche I focussed on getting the tour and knowledge of the area from Sam, WIll Fraker and Bryce Viola. They proceeded to take some of the classics down, Sam took home Fotowa Sit V11, and flashed the classic In Plain Sight V8, while Andy quickly scored Bambino V8, Bryce and Will both sent the beautiful True Bleau V10. Bryce also managed the third ascent of Cubic Zarconia V12 and nabbed Fantasia V11. As the sun set and the temperature dropped below freezing we checked out the incredible Speed Boulder. If you're a strong board climber then this is you're dream block, with an amazing collection of hard problems on one face - Something From Nothing V11, Double Down V12 and Roses and Blue Jays V13. I really can't get over the fact there is this quality of bouldering within striking distance of NYC, so much to go back for, but first I need to rehab this finger.